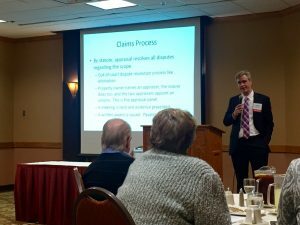 Hellmuth & Johnson attorney, Ed Beckmann, presented at the CIC-Midwest Lunch & Learn on Thursday, March 31st, 2016. Ed discussed coverage of various property insurance claims, the claims process, and hot topics in the field. This included an overview of how to reach an insurance policy, how the law forms part of the policy, and how the law interprets it. He went into claims process, including proofs of loss, examinations under oath, and an appraisal. Finally, Ed talked about hot topics such as the enforcability of limited matching endorsements.